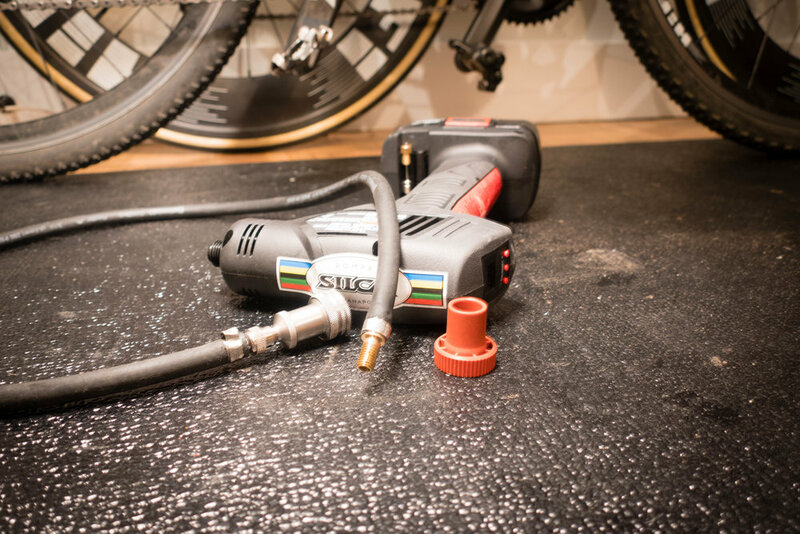 You’ve probably seen one in the parking lot of your local ‘cross race—a battery-powered, handheld cordless air compressor with a Silca presta valve head. Is it necessary? No. Is it cheap? Definitely not. Is it pro-as-hell—and one step closer to achieving “Belgian-level” cyclocross gear-status? Absolutely. So here you go — get ready to spend some money and save some valuable trunk space with the ultimate guide on how to set up a cordless air compressor. The finished product: a handheld air compressor that is perfect for CX. When I built this compressor I had one goal: Have an air compressor that I could use both at home and at ‘cross races that would work to both set tubeless tires and help Coalition CC riders dial-in their pressure on tubeless and tubular setups alike. Initially I was going to buy a proper air compressor, with a tank like you would see on a construction site. Instead TBD member Clay Parker Jones pointed me in the direction of doing it the right way—with a handheld air compressor from Craftsman or AirHawk. You may notice that the AirHawk and Craftsman inflators both come with presta converters. So you may think: I’ll skip the Silca stuff and stop reading. Big mistake. For one—look at all of the text and photos that are still below. For another, their presta adapters are trash; and difficult — at best — to use. Once you’ve acquired all the right gear, it’s time to get to work. First, unscrew the red cap that attaches the hose to the inflator; and then remove the stock hose. The reason we’re dumping this hose is because it’s braided and would fray once cut — not a good look. Pull the hose out through the red nozzle. Note: This may result in the black rubber gasket that holds the barb at the end of the hose falling off. If this happens, just take the gasket and seat it back inside the compressor nozzle. A gold hose barb inside the hose and secured by a clamp. The barb then goes through the red screw cap again, which screws onto the inflator. On the other end of the hose, insert the Silca Schrader chuck barb into the hose and use pliers to tighten the clamp around the outside of the new Silca hose to secure the chuck barb in place. Then simply thread the Presta Head onto the Schrader chuck, and you’re good to go. A pro-tip on Silca presta valve chucks: They are known from time-to-time remove the valve core entirely when first used. To avoid this, you can first “loosen” the chuck by gently putting needle-nose pliers inside in the presta head and working them clockwise around the red gasket. Don’t go too hard lest you damage the gasket. The schrader chuck barb is installed on the hose; and the Silca presta head threads into the chuck. The digital pressure display is the killer feature of this unit: With precision to a tenth of a PSI and an easy to read display, you'll get exactly the pressure you're looking for every time; there's no guess work involved. And that's it. Your wallet is now lighter but you may as well sign up to be a pit-man for a Belgian UCI race.